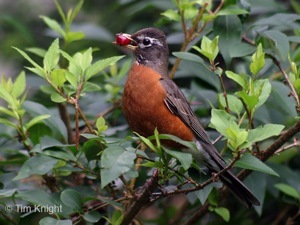 Description: The American Robin is about 10 inches long (25 cm), and has a brick-red breast, with gray wings, head and back. The short beak is yellow with a gray tip. It has a white throat with black stripes; the males throat is darker than the female. The lower belly is primarily white. It has a long gray/black tail. Males and females look similar, but the males have a darker head (often black) and the female has paler color. There is a broken white eye-ring that surrounds their dark eyes. The juvenile's under parts are tinged with cinnamon and heavily spotted with brown. The young birds have a very faint eye ring and short tail feathers by the time they leave the nest (see the photo on the left). Songs: The robin makes a musical whistled phrase, "cheerily, cheer up, cheer up, cheerily, cheer up." Call note is a sharp "chup." Also produces a very high-pitched thin whistling note. 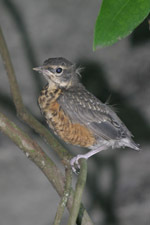 Range / Habitat: In North America, American Robins breed from Alaska east to Newfoundland, Canada and south to California and east to Florida. The American Robin can be found in farmlands, suburbs and urban neighborhoods. Click the range map to learn more about the distribution of American Robins in Washington. 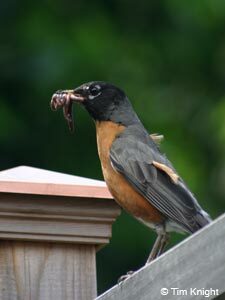 Diet: The American Robin eats earthworms, insects and berries. 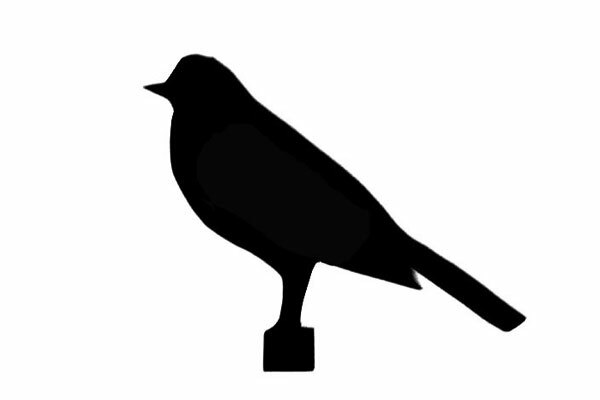 Behavior: The American Robin is commonly heard singing in forests and suburbs. Calls include a loud, liquid song, a variable cheerily cheer-up cheerio. Another call is a rapid tut tut tut. Robins are often seen on lawns, with their heads cocked, searching for earthworms and insects. 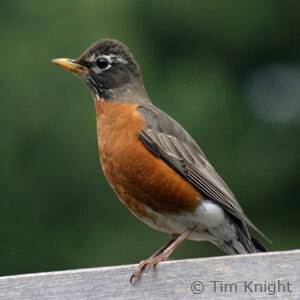 American Robins are Neotropical migrants, although they are found year-round in mild climates. Nesting: American Robins pair-bond during the breeding season. Females are primarily responible for building the nest that is made of twigs, mud and lined with dry grass. 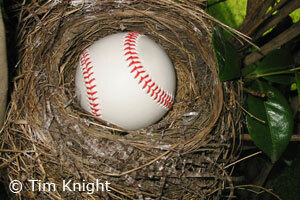 Sometimes the nest will have string or ribbon that the robins find in the nearby (view nest photo). 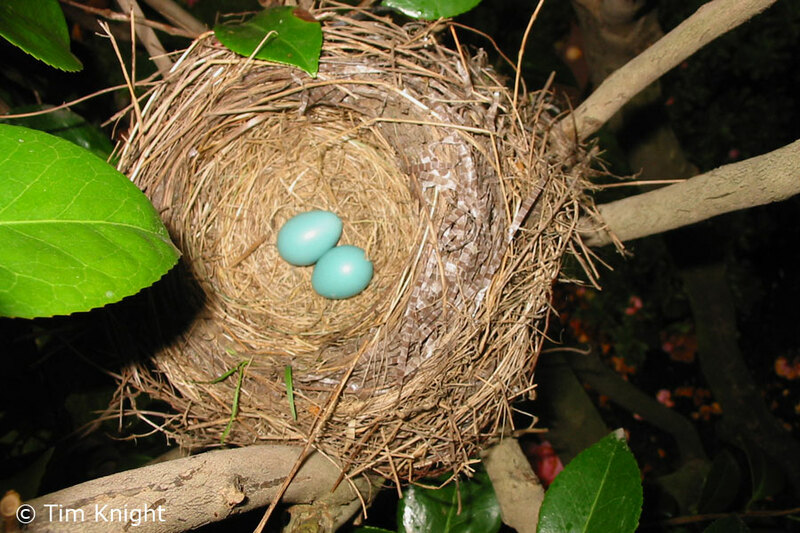 The bowl-shaped nests are built in a bush, tree or under the eaves of buildings - 5 to 25 feet off the ground. The nest is 6 inches across and 4 to 6 inches high. 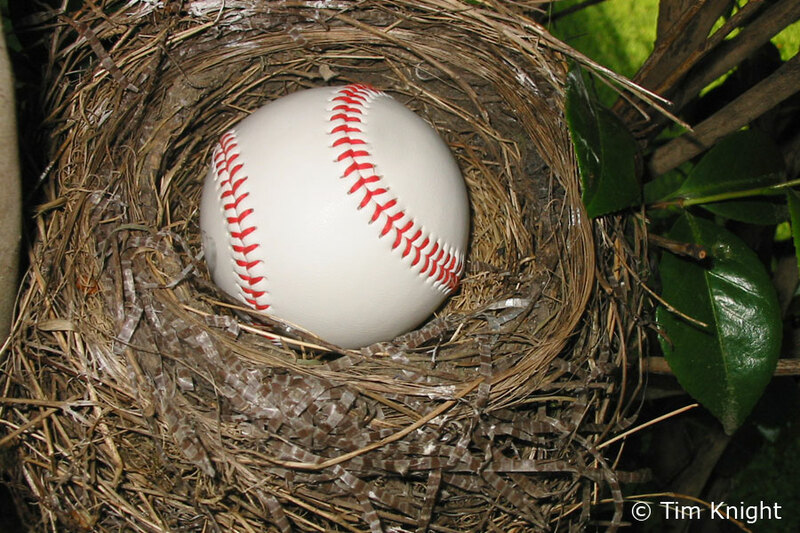 The rounded inside area of the nest is about 3.5 to 4 inches in diameter, which is large enough to hold a baseball (see photo below). Sometimes the nests are reused. This nest was built on top of a robin's nest that was constructed three years ago. So, if you find an old bird nest it's a good idea to leave it alone. The female typically lays two to four light blue eggs - about the size and weight of a quarter (see photo). The female incubates the eggs over a two-week period and both parents care for the young. The eggs take around two weeks to hatch and the chicks will fledge when they are about 14 to 16 days old. The female may have two broods a year. The young are born with their eyes shut and first open their eyes around five days after hatching. Both parents aggressively defend the nest area. They produce a series of alarm calls that distract predators and cause the nestlings to duck low in the nest to go undetected. Male robins are especially known for dive-bombing people and predators within ten feet of a nest. Photos of American Robin male, female and juvenile. 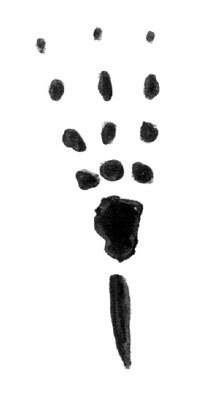 Source: This information is based on direct observations by Tim Knight of three nest sites in Seattle, Washington. Behavior and nesting activity can vary with location.